Panasonic has unveiled its new Lumix DMC-GF5, featuring a new sensor and 14 digital filter effects, while predicting that global CSC sales will outpace DSLRs by 2015. Boasting a ?world?s fastest? AF speed of ?0.09secs?, the Panasonic GF5 is also said to outperform Panasonic?s current DMC-GF3 micro four thirds camera in other areas. The GF5 is equipped with a new 12.1-million-pixel imaging sensor, designed to be capable of delivering a maximum equivalent ISO sensitivity of 12,800 and a minimum of 160, together with a Venus Engine VII HD2 imaging processor. The sensor also aims to deliver lower noise, explained Panasonic Japan?s imaging consultant Michiharu Uematsu, in an interview with AP on Tuesday. Sporting a 3in, 920,000-dot (touch control) LCD screen, the GF5 features a top burst rate of four frames per second, at full resolution, and HD video in both AVCHD and MP4 formats. And a new user interface is designed to advise inexperienced photographers on which is the most appropriate lens to use for a given situation, for example. Dynamic monochrome and one-point colour are among the 14 digital filter effects Panasonic has built in, as a direct response it says, to features now found on many smartphones. ?With so many [photo] applications available for the iPhone, people find it strange that your camera can?t actually do that,? said Panasonic UK’s Lumix G product manager Barnaby Sykes. As with mobile phone displays, GF5 users will also be able to set a picture of their choice as the ?home? screen, he added. The GF5, due to arrive in the UK from mid-May, will cost around £550 with a 14-42mm X lens and £450 with the standard 14-42mm zoom. The GF5 will carry a body-only price of around £349, though it is not clear whether this no-lens option will be available at the time of launch. 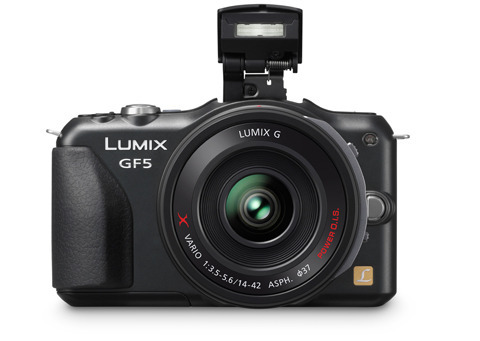 The GF5, which includes 23 scene modes, weighs 267g and measures 107.7×66.6×36.8mm, excluding protusions, according to Panasonic. Borrowing the improved handgrip of the Lumix DMC-GX1, plus a stereo microphone, the newcomer will be out in a choice of black and white finishes. Industry figures supplied to Panasonic suggest that CSCs will grab a 51% slice of the global market for interchangeable lens cameras by 2015, compared to just 22% today. Taiwan tops the charts in the take-up of mirrorless system cameras where CSCs account for 54% of all removable lens cameras sold, compared to 51% in Japan, 28% in the UK and just 18% in the United States. However, Panasonic admits its market share has slipped since the arrival of new competitors such as Nikon?s 1 system and the firm is embarking on a mission to publicise the benefits of its MFT models. Sykes said that Panasonic this year plans to focus on communicating the ?edge-to-edge sharpness? advantages of MFT imaging sensors compared to, larger, APS-C sensors. Panasonic representatives were at great pains to stress that ?image quality is not only about sensor size but signal processing and optical performance?. The firm plans to deliver this message to high-street retailers whose staff, it hopes, will pass this information to consumers. Sykes said that the continued loyalty of many photographers to major camera brands such as Canon, owing to their long photographic heritage, continues to pose a ?massive challenge? to Panasonic, despite the firm’s success in the CSC arena. 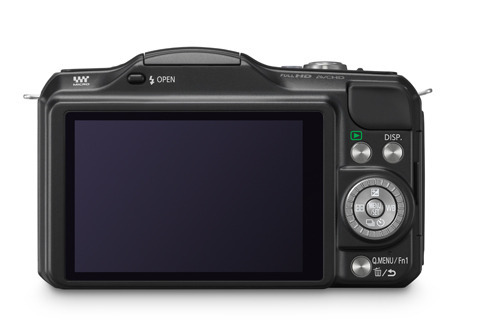 Panasonic expects Canon to launch its first CSC in 2012. Panasonic says all of its MFT cameras are made in Japan, apart from the G3 which is produced in China.